The consumption of bottled water is provoking a large increase in plastic waste. In our islands there are initiatives to change this tendency and it is very interesting to learn about them. 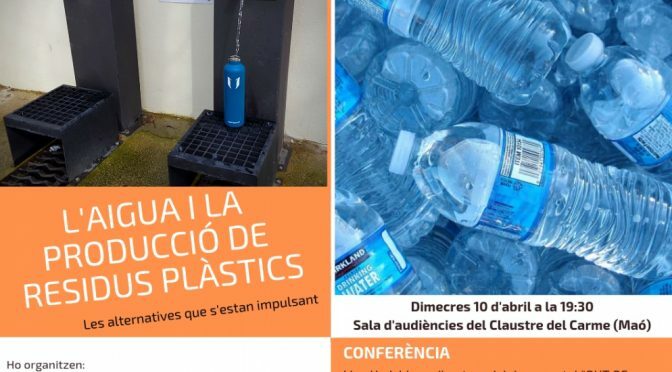 This Wednesday, 10 April, there is a talk in Mahon organised by CleanWave, which promotes the installation of places for providing drinking water without plastic containers. The talk will be accompanied by showing the film “Out of Plastic” made in Mallorca. Following data from the World Bank, the consumption of bottled water has increased by 233%. From these excessive figures, it is estimated that Spain daily throws out some 9 million plastic bottles, of which half end up in waste dumps or in the environment and where they can take up to 1000 years to degrade. Menorca is one of the places where contamination of the land caused by nitrates coming from waste dumps is so out of control that some municipalities have problems with drinking water. Many people buy bottled water because the parameters established by the health authorities regarding the presence of nitrates are exceeded in some areas. In Mallorca, CleanWave successfully promotes a network of points that dispense water suitably treated for drinking. Reusable bottles can be filled with water, free of charge, thus avoiding generating plastic waste each time drinking water is required. In the same way, on the outside of the Calabria building, in the Santa Eulalia street in Mahon, a water fountain has been made available for the public providing free drinking water with a system that eliminates the nitrate concentrations and other impurities that there might be. More and more people are using it. There is a similar fountain in Sant Lluís and we hope that the network continues to increase so as to be able to provide free drinking water at various points, at least, in all the urban centres of the island. Private initiatives are also providing a network of points for free drinking water in Mallorca without causing plastic waste as will be explained in the talk by the Line Hadsbjerg, co-founder of the CleanWave movement The talk will take place today, 10 April, at 19.30 in the Sala de Audencias of the Claustre del Carme in Mahon. This is an initiative between CleanWave.org, the Mahon Town Council, and GOB. Please spread this message amongst your friends.